NY Topiary To Pick Up Greenery and Flowers! My mother was a gardner. She firmly believed happiness was found in the delightful walls of a garden, and she had a hand painted sign hanging on her front door that read "Find Me In The Garden" and that is just where she went daily after work to paint and prune her roses. With Mother's Day this weekend, I am reminded that there is certainly nothing like fresh flowers to brighten your day. So, what's an urban dweller to do but take to the local city garden center, and in New York City it's a treasure trove around every corner. Much smaller than years ago, the NYC Market sprung up in the late 1800s with growers from Long Island and New Jersey commuting in to sell their wares. The Market grew around the industry offering those "in the know" amazing floral finds and with certain credentials the chance to buy "wholesale" flowers and greenery. Well, today that has significantly changed but any early morning walk at 5:00 am down plant and flower lined West 28th Street (between 6th and 7th avenues) tell a different tale. You will see a busting mixture these days of magazine editors scooping up flowers for photoshoots, NYC dwellers mixed with the occasional flower lover stumbling around in disbelief at the offerings. The Market is certainly busy but it is no longer a well regarded secret and anyone with a credit card can now purchase an abundance of flowers from all over the world. Each shop has their own specialty. For cut branches I prefer-US Evergreens; fresh flowers-Associated; tropical offerings--Caribbean Cuts; and I love meandering the aisles at Jamali for ribbon, baskets, candles and supplies. But, my all time personal favorite is the tiniest of shops nestled but chock-filled with topiary, ferns, herbs and an abundance of greenery, NY Topiary. When working on an interior design project I like to finish it off nicely by scooping up beauties at the Market to bring to my client's home. This day we were on a mission as we were in the throes of decorating a tabletop design at Grand Central Station for a very fancy black tie fundraiser at Cipriani restaurant. 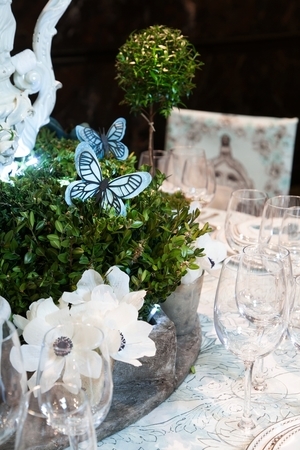 We were called to design a table in a certain architectural style and chose to showcase a Roman Garden, which gave us the perfect excuse to infuse the table with topiary. moved over from the seaport area in 1890s in order to be closer to the affluent residents who shopped at the nearby department stores, the NYC flower market flourished on West 28th Street where it still remains today. According to a NY Times article in 2004, farmers from Long Island took the ferry into the city with their goods to sell, and the Market grew from there. It was estimated that at one point in the 1970s the NYC Market was one of the biggest earning Flower Markets in the world. Today, it's smaller and real estate prices are continuing to choke out vendors, but it is still thriving in my book. I love topiary and every project I work on where I can sneak in the opportunity to showcase a little coiffed cut greenery, I do. You may remember my post about the History of Topiary on the blog. Topiary is a lovely, historic art form that goes back in time throughout many cultures from the Greeks to the Japanese. From myrtle to rosemary, fern, ivy and boxwood it seems that almost any greenery can be transformed into a lush work of art at NY TOPIARY. To Shop at NY Topiary you must arrive in the early morning in order to get the best finds because each and every time I frequent the shop I inevitably run into someone famous nabbing the day's offerings. I love all the patina'd pots spilling over with mossy wonder, and this particular day the ferns had me smitten. ask for Milton or Jorge, and tell them I sent you! 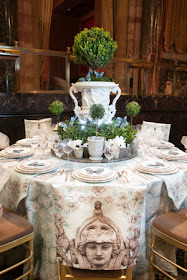 we cooked up a lovely tabletop design utilizing potted Myrtle topiary for a table design in Grand Central Station for the Lenox Hill Neighborhood House gala. We created a live hedge using cut English boxwood, oasis and surrounded the hedge with these potted topiary we planted in Roman looking cement pots. 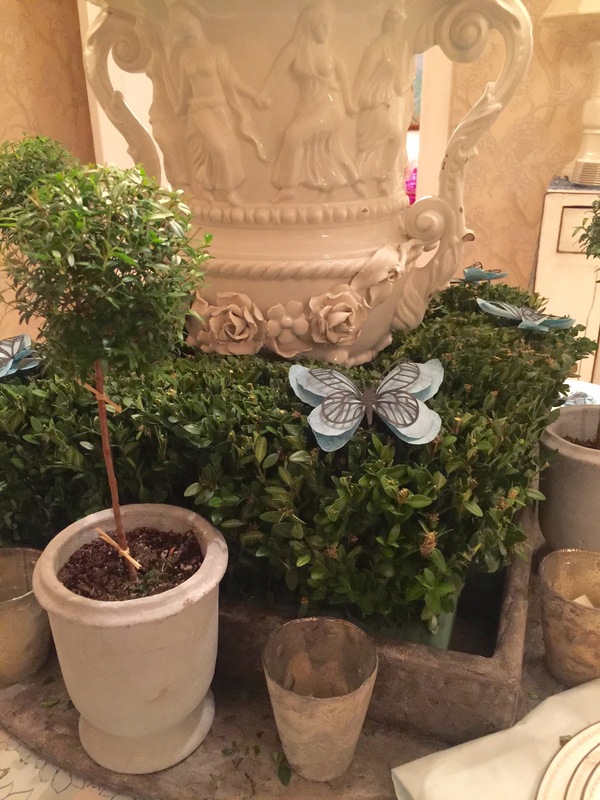 The centerpiece of our design was a beautiful Italian antique urn from Newel Gallery, and we built the hedge around it then topped it off by planting a large boxwood orb in the urn. We filled small julep cups with black centered, white anemones and lit the entire sculpture up with battery operated candles. We set the table with the prettiest of plates, the Pearl Platinum pattern from Lenox USA china. Oh, and we made a trio of custom made fabrics from our Root Cellar Designs textile company, and found an artisan in France to hand cut paper butterflies to boot. Our finished table was featured in Veranda Magazine and called "A Work of Art"--Thank You NY Topiary!